Recovering from surgery or illness? Cooking every day just too difficult? 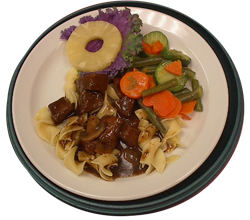 Meals on Wheels delivers two tasty, nutritious meals daily. Let us do the work while you recover or lighten the load in general. Our volunteer-driven organization delivers every day, so you’ll never have to worry about weekends or holidays. More information about our service and our organization is available in these pages. You are also welcome to contact us for information.